Denise Chevin reports on how David Miller Architects and Hill Bespoke are ensuring defect-free homes in east London. 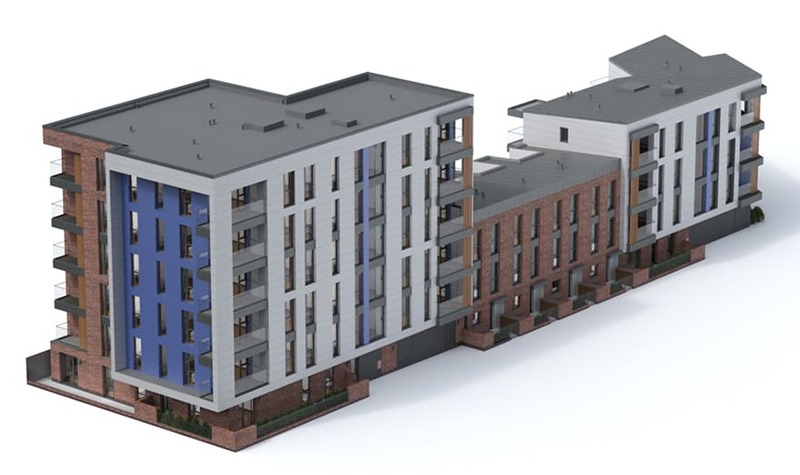 Offsite manufacture and BIM are being harnessed to deliver a housing scheme in east London, which could provide a blueprint for improving quality, with minimal disruption to other site residents, whilst meeting tight timescales and budgets. David Miller Architects is working with Hill Bespoke to deliver the fourth and final phase of Orchard Village for Clarion Housing. Orchard Village is the redevelopment of the Mardyke Estate in Rainham, in the London Borough of Havering. This £30m final phase of the estate redevelopment will create 130 new homes for rent and shared ownership. It embodies the recommendations set out in the report from the London Assembly’s Planning Committee Designed, sealed, delivered, which called on London mayor Sadiq Khan to encourage offsite manufacturing to solve London’s housing crisis. Phase four started on site in September and when completed at the end of 2018, there will be 530 new homes across the development. Phases one to three of the Orchard Village site had been the subject of large numbers of tenant complaints with a high level of dissatisfaction for both the client (then Circle Housing, before it merged with Affinity Sutton to form Clarion) and tenants concerning the overall quality of the buildings, insulation, leaks and the internal fixtures of each unit. Therefore, the client wanted a different approach in phase four, appointing a new contractor, Hill Bespoke to deliver it. It has become particularly important for the housing association to demonstrate that it is listening to, and acting on, resident concerns and taking positive action to alleviate them. DMA was appointed post-planning by Hill Bespoke, on the back of the success of a previous project they had worked on together. This had used pioneering technology and BIM to renovate listed barns near Cambridge, for which they have won a number of awards. By this stage the scheme had already received planning permission for the masterplan so the footprint and massing of the buildings had been established. The apartments in this phase are arranged in a number of blocks of differing heights. The main block is shaped like a quarter of a circle around a courtyard, so includes a sweeping curve (see below). Elements Europe, a Telford-based volumetric unit manufacturer which specialises in student accommodation, is making the modules. These come fully fitted out with services, kitchen, bathroom, doors, windows, finishes and lighting specified to a particular Circle Housing standard. They are also fitted with balconies. This is a relatively new form of construction for large-scale housing schemes, so this is a pioneering project. The steel modules will be “stacked up” and then clad on site with traditional brickwork – this exterior facade will also form the curved element. The bricklaying trades will follow on after the volumetric units have been assembled. The first modules will go on site in November 2017 for completion at the end of 2018. Also, the modular approach for construction reduces traditional space tolerances, which enabled DMA to add to the size of individual apartments. The challenge for DMA, working as the executive delivery architect, was how to configure the units to fit the masterplan footprint most efficiently. Each modular unit is about 12m by 4m – the maximum size it’s possible to transport one on the back of an articulated lorry. Hill Bespoke also required the project to be BIM Level 2 compliant and for DMA to provide a 3D model suitable for generating accurate components and material quantities. The accuracy of BIM allowed DMA to forensically and rapidly resolve upfront the difficult structural requirements in the scheme (load-bearing walls for modular placement) and detailed information to inform the fabrication stage. Meticulous, detailed design work of all apartments and homes prior to manufacture enabled full quality control of all fixtures and fittings (building services, plumbing, socket placement, etc). 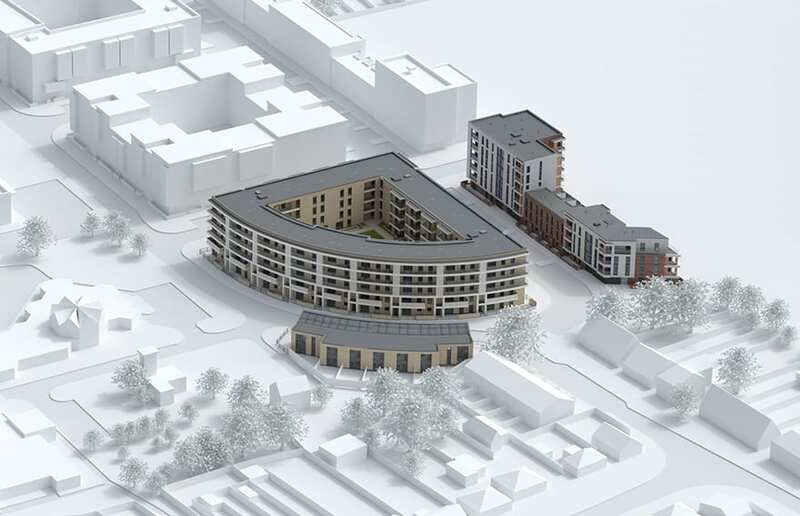 The use of BIM to resolve the complex design issues of creating modular apartments within a curved design, ensured that all interfaces and details were resolved prior to manufacture so that completed units could be fabricated for a precision fit. However, the data generated is far more than there is usually with a project. DMA is also running clash detection associated with each unique unit – which can run to 100 separate clashes being found, including glitches like pipe openings. “This offsite methodology needs a design frieze early on, and this will give that opportunity,” says Murphy. In a belt and braces approach to ensuring quality, each element within the units is also assigned a unique bar code, which is scanned on installation, which also provides an extra layer of quality control. DMA has also been working with warranty provider NHBC to reassure them about the construction and quality process. “It certainly has been a learning curve. But if we can make it work on this scheme, it proves that it can work more widely,” adds Murphy. 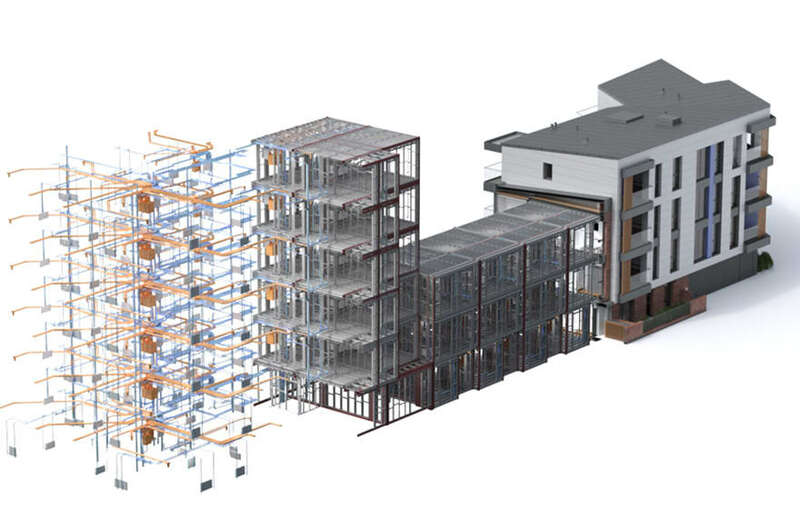 The models are hosted in Autodesk, and DMA is using its 360 suite to manage the information and Navisworks for clash detection within the models.